Adam Gordon from Candidate.ID teaches us new ways to build and engage talent pipelines to hire faster. Adam and the Candidate.ID team are experts in using marketing automation for recruiting. This man is on a mission(!) to use content marketing and demand generation to improve the quality and quantity of applicants. 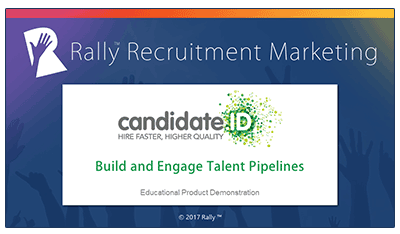 He shows us how Candidate.ID’s talent pipeline software keeps leads warm and can help measure a candidate’s desire to work for an organization in real time. Length: 34 minutes.